May 5, 2012, Las Vegas NV – Gaining more than 70% of the vote on the first ballot, former New Mexico Governor Gary Johnson Saturday earned the Libertarian Party nomination for President of the United States. As the Libertarian nominee, Johnson is expected to be on the ballot in all 50 states. Accepting the nomination, Johnson said, “Millions of Americans want and deserve the opportunity to vote for a candidate in November who will get us out of the war in Afghanistan immediately, truly cut federal spending, end the failed war on drugs, repeal the Patriot Act, and support marriage equality. I am excited to offer that option: A proven fiscal conservative, a proven defender of civil liberties, and an advocate for social tolerance." Jim Gray, retired Judge of the California Superior Court, was nominated as the party's candidate for Vice-President. Gary was endorsed by Governor Johnson. The Libertarian National convention is being held in Las Vegas, NV, and concludes Sunday, May 6. About Presidential Candidate Gary Johnson: Gary Johnson, two-term Governor of New Mexico from 1995-2003, has been a consistent and outspoken advocate for limited, efficient government and personal liberty. 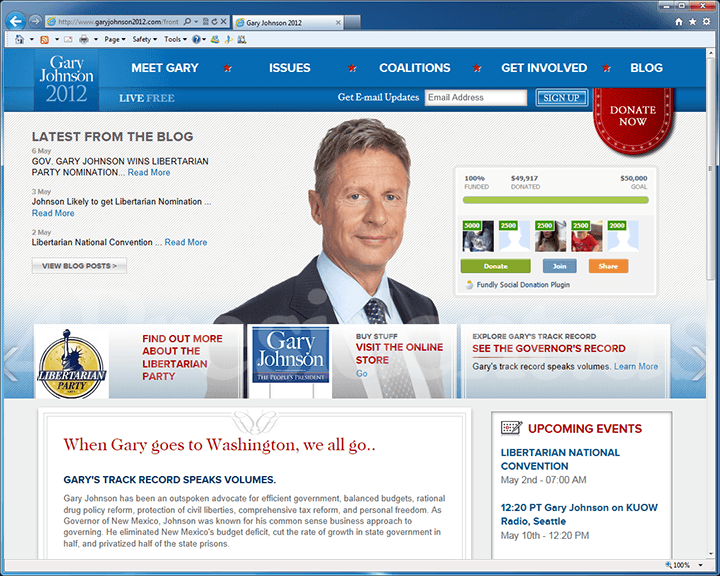 Johnson switched from Republican to the Libertarian Party on December 28, 2011. As the Libertarian nominee, Johnson will appear on all 50 states' ballots as the third national presidential nominee. An outspoken pro-Constitution Libertarian, Johnson opposes the war in Afghanistan, demands greater transparency at the Federal Reserve, would cut Federal spending by 43%, supports a woman's right to choose, opposes gun control, supports gay marriage equality and supports the legalization of marijuana. An avid skier and bicyclist, he has reached the highest peaks on four of the seven continents, including Mt. Everest.